Don't let these high dividend yields tempt you to buy. In today's low-interest-rate environment, it is natural for retirees to be attracted to stocks that offer up big dividend yields. However, not all dividend-paying stocks are created equally, so it makes sense to be highly selective when you are on the hunt for potential targets. That way you can avoid filling your portfolio with potential duds. To that end, I think that retirees would be wise to avoid buying shares of AstraZeneca (NYSE:AZN), Guess? (NYSE:GES), and Gannett (NYSE:GCI). Read on to find out why. Pharmaceutical companies sell products that are recession-resistant, which makes the sector a great place to go hunting for income-producing stocks. With its trailing dividend yield topping 5%, you might think that pharma giant AstraZeneca would be a great company to consider buying today. However, I'd urge you to look under the hood before you hop in for the ride. AstraZeneca is currently struggling with the loss of patent protection on its blockbuster drugs Crestor and Nexium. Generic versions of these drugs have been flooding the market over the last few months, which caused sales in the U.S. to plunge by 82% and 50%, respectively, in the third quarter. That pulled the company's overall revenue down by 3%, while core earnings per share dropped by 10%. Management is doing what it can to fill the revenue gap, but that's going to be a tall challenge. Through the first nine months of the year, Crestor and Nexium rang up more than $4.2 billion in total sales, which accounted for more than a quarter of overall revenue. As a result, analysts are currently projecting that the company's profits will steadily decline over the next five years. If true, then AstraZeneca's generous dividend payments could be on the chopping block, which is why I think this stock should be avoided. 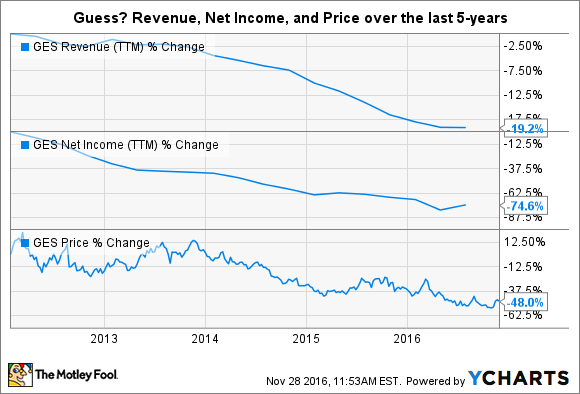 It has been a rough couple of years to be a shareholder of the fashion retailer Guess?, and it is not hard to figure out why. The company operates in an ultracompetitive industry, and management needs to stay on top of consumer trends in order to remain relevant. Guess? was quite successful at pulling that off years ago, but more recently the company has lost its touch. As a result, revenue and net income have plunged, taking the company's share price with them. GES Revenue (TTM) data by YCharts. Management is aware of the company's struggles and has promised to put a number of initiatives in place to help turn the tide. These include investing heavily in China, getting more aggressive with social media and digital marketing, and making the supply chain more efficient. If these moves work out, they might be enough to turn the company's fortunes around. Of course, this is the fashion industry we are talking about, so there are never any guarantees of success. If the company can't manage to find its bearings with the changing fashion tide, then net income might continue to drift lower. Right now Guess? offers up a sky-high yield of 5.6%, but it also sports a dividend payout ratio of 113%. If the bets to reignite profit growth fail to pay off, the company may have to reassess its dividend policy. For that reason, I think the safer bet is to simply keep away. It is no secret that newspaper companies have struggled to adapt to the digital world. Gannett, the publisher that owns USA Today and several other news properties, has responded to the decline by opening up its wallet and going on a shopping spree. The company recently scooped up the local marketing specialist ReachLocal and also added the newspaper printer North Jersey Media Group to its empire in the last quarter. It also tried to acquire Tronc, the owner of properties like the Chicago Tribune and the Los Angeles Times, but that takeover attempt fell through. While this strategy may help to mask the company's struggles over the near term, I have my doubts that this model is sustainable. After all, there are only so many potential acquisition targets out there, and when you dig into the company's results, the story isn't pretty. Last quarter, Gannett's operating revenue declined by more than 8% and profits plunged, which forced management to slash costs. But that strategy can't work forever. While I'm hopeful that the newspaper industry as a whole will find a business model that thrives in the digital age, the numbers continue to suggest that publishers haven't found it yet. Until they do, I think that Gannett's investors can expect more revenue and profit declines from here. With the stock yielding more than 6.5%, it might not be long until management starts to look at the dividend as a way to save money, too. All three of these dividend-paying stocks are going through tough times right now, which I think makes them too risky to own. If income stocks are what you are after, I'd suggest that you skip these three and look for high-quality businesses that are growing and selling at a better price instead.